“Wait, what… What do you mean ‘remote debugging apps running locally, how is that remote in any way?’” you might ask. Well, it (sort of is). Did you know that Chrome OS can run Android apps, and, starting with Chrome OS 69, you can install Linux support? Search for “Linux” in Settings, tap Install, and in a couple minutes you’ll have a terminal window. From then on, you can install use the same familiar development tools you’re using on Mac OS or Linux: Node, npm, VS Code, Android Studio and so on. Linux support is still in beta, but (almost) anything you can apt install works fine. The umbrella term for Linux application support in Chrome OS is Crostini, and you can read more about it on the Crostini page. Chrome OS has gone from being the operating system with (perhaps) the fewest apps you could run, back in 2011 (just web apps and some Chrome apps), to the one that can run the most — Android, Linux, and web apps. This works thanks to a container/VM architecture that has only a small overhead, and no emulation while running Linux or Android apps. For web app developers, this means that you can develop on Linux, then test on Android browsers running natively, on the very same machine, locally. Hence, local/remote debugging. To do that, there are a few steps. Set your Chromebook to Developer Mode: press Esc + ⟳ + Power. A yellow exclamation point (!) or “Please insert a recovery USB stick” is displayed. Press Ctrl+D to begin developer mode, then Enter. Run adb connect 100.115.92.2 (per https://developer.android.com/topic/arc/studio#running_locally) and accept the Allow USB debugging prompt. Launch the Play Store and install Chrome Dev for Android. (We’re choosing Chromium Dev so that its icon is easy to distinguish from other Chrome instances we’ll be running on the Chromebook). Open a terminal and run ip addr show. The 100.115… number is the IP of the Linux container. Launch Chromium (from the launcher, or by typing chromium in the terminal). 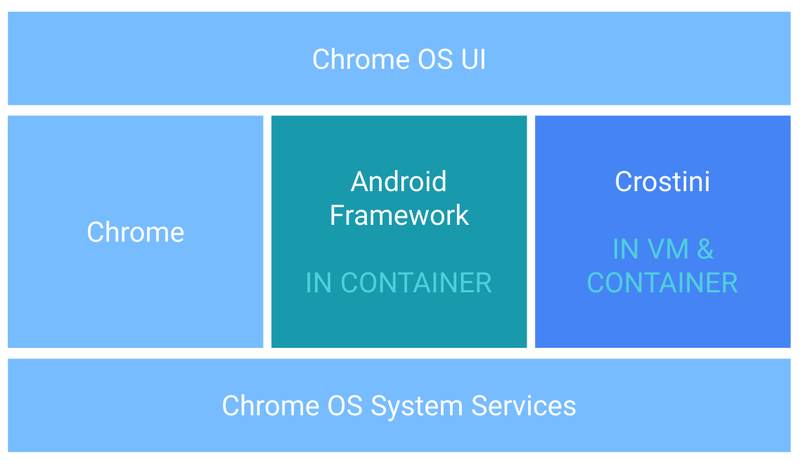 It’s necessary to run a Linux Chrome/Chromium rather than the OS Chrome, because the ADB bridge is established between the Linux container and the Android container. In Chromium, go to chrome://inspect. You should see your web app’s tab in the list of targets. Click inspect. You should see something like this (the screencast shows the Squoosh app). Remote debugging from Linux Chromium web apps running in Android Chrome, on Chrome OS. If you see “Pending authentication: please accept debugging session on the device” in Chromium DevTools, reboot the Chromebook. We’re working on a fix! To learn more about what Chrome OS can do for web developers, check out my talk at Chrome Dev Summit ’18.